Balsam garland adds a charming trim to your winter wonderland decorating! White pine garland, a feather cascade flowing over railings, stoops, and doorways! Fraser fir garland, enjoy that famous fragrance and rich silver-green hue! The perfect choice for that indoor accent! BBC 8 Brass Basket Centerpiece 20"
Brilliant silk flowers, fresh pine wisps, frosted cones and a big puffy red velvet bow, all in a bold brass basket! Welcome all to your table for those special season get togethers. GT 9 Golden Trumpet 20"
Preserved eucalyptus, painted cones, with silk flowers and poinsettias, bursting from a 14" brass horn! A rich red velvet bow pulls the whole look together on this great seasonal gift! 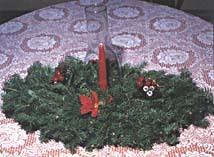 TD 6 Table Delight 15"
The perfect addition to your festive holiday table! Mixed greens are topped with assorted piks and berries, and a crystal clear glass chimney over a colorful wax candle! 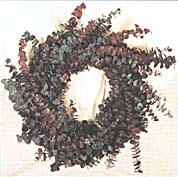 EW 10 Eucalyptus Wreath 20"
Start a new tradition! Celebrate the holidays with our Oh-so-Fragrant, preserved eucalyptus wreath! A jolly mix of red and green sprays for that unusual gift idea! 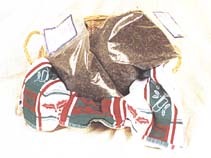 Coming to you in a one, or three pound bag, our Minnesota grown wild rice, is a gift that they'll enjoy every time they sit down to the table! With delicious recipes included, you'll want a bag for yourself!